It was a case guaranteed to spark a media feeding frenzy--a young mother, blond and pretty, disappears without a trace from her South Boston home, leaving behind her four-year-old daughter as the only witness and her handsome, secretive husband as the prime suspect. 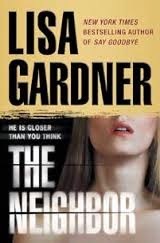 Review: While this is the 3rd book in the series, this is the first where Detective DD Warren plays a main role. I wasn't overly impressed with her investigation skills but Gardner excels are sucking me in with her multiple narratives. So, a lackluster lead detective didn't hurt this for me at all. I literally could not put this book down and read it in one sitting. This was 5 stars until the very end. The conclusion wrapped up too quickly for my taste but this was still a great thriller. Another huge plus-I was convinced I knew the mystery but was surprised that I didn't have it all figured out.